For years Venezuela has been mired in a seemingly unending crisis – political impasse, economics chaos, social upheaval. Yet over the past two weeks that crisis appears, at last, to have reached a tipping point. A notoriously fractious opposition has rallied behind a single, youthful leader – Juan Guaidó – who has won the recognition and support of most of the western world. Meanwhile despite growing popular discontent even among former chavista strongholds, Nicolas Maduro remains in power with the support of the military as well as global players like Russia, China, and Turkey. 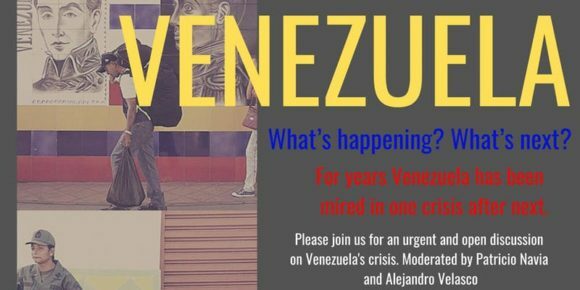 As the stalemate grows and the crisis deepens, what possible futures are in store for Venezuela and it’s people? Is open war on the table? What role should the international community play? And how are Venezuelans themselves responding? Join us for a conversation about the current situation in Venezuela by a panel of distinguished scholars and experts on the South American country and the region – Beatriz Borges, Dorothy Kronick, Francisco Rodríguez, and Christopher Sabatini. This conversation will be moderated by CLACS faculty members Patricio Navia (Liberal Studies) and Alejandro Velasco (Gallatin, History). This event is free and open to the public. Co-sponsored by: Urban Democracy Lab, and North American Congress on Latin America (NACLA). This entry was posted in Northeast US Events on February 6, 2019 by Teanu Reid.